Positive: Nice design; good price; high autonomy. Model: Usually in the PC market space its very common to see mainstream units or even high-end models taking the headlines however in actuality the real market movers are basic models such as the Acer Spin 1. While spec wise the Acer 1 may not seem earth shattering it is actually quite decent for your average consumer. Taking a look at the spec white sheet the Acer Spin 1 sports an Intel Celeron N3450, 4 GB of RAM and 500 GB of standard hard disk storage. 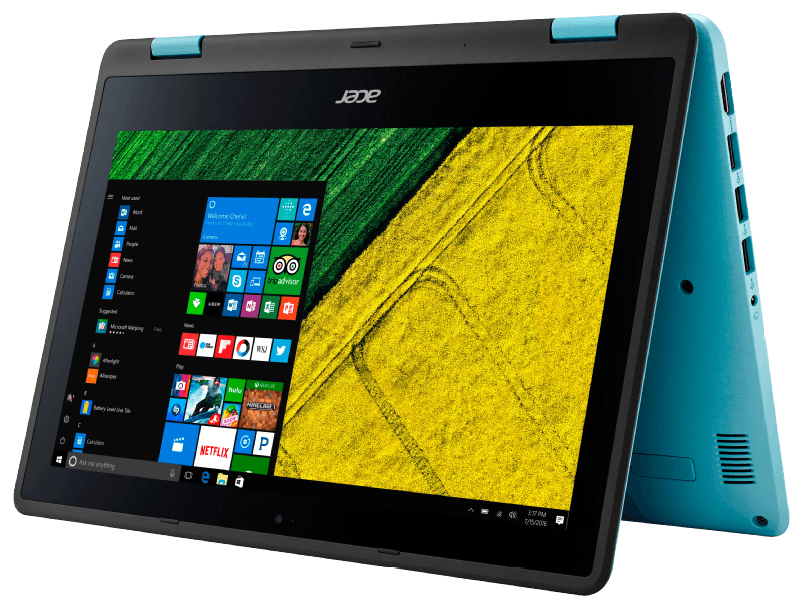 Construction and chassis-wise the Acer Spin 1 is mainly made out of a two tone plastic chassis which does have a brushed metal texture. Overall the chassis is well constructed and is solid enough despite not being made out of aluminium or even magnesium alloy on higher end models. In terms of IO there aren’t much surprises as this is mainly a budget convertible, mainly to note here the Acer Spin 1 has 3 USB A ports and 1 HDMI port. Next would be user input, Acer has chosen to go with the chiclet styled keyboard which is quite common among manufacturers. The keyboard has a slightly rough texture for better finger grip, keystrokes are about shallow at best but still provides a decent amount of feedback which should still satisfy most typists out there. As for the touchpad, it is quite large taking up almost one third of the bottom half, it also has a smooth surface which makes gliding on it quite satisfactory. Because this is a convertible it is also worth mentioning that the LCD panel is touch enabled, with up to 10 touch points. The LCD remains quite responsive and accurate to touches and can also be used with an active stylus. Despite being 11.6-inches, the display is an IPS FHD based panel which means colors are accurate and vibrant, this panel also does provide a wide range of viewing angles which is a plus considering its price bracket in the market. Moving over to the Acer Spin 1’s aural capabilities it scores decently well although bass seems to be lacking. Another downside would be that the volume seems to feel lackluster even when at the maximum setting. Otherwise listening experiences should be left with the use of headphones or external speakers. As the Acer Spin 1 is powered by an Intel Celeron N3450 power consumption remains low with battery life topping out at 9 hours 24 minutes which is very impressive when compared to its competitors of the same class. Verdict being the Acer Spin 1 may not impress most people in terms of hardware oomph but it provides satisfactory processing power for simple office use. 74.45%: This rating is bad. Most notebooks are better rated. This is not a recommendation for purchase.